Lea Denny (Native Hawaiian) is a strong advocate for First Nations youth and is committed to making a difference in people’s lives. Lea is trained in Neurosequential Model of Therapeutics (NMT) and is a Mental Health First Aid (MHFA) Instructor. Lea is the Founder, CEO, Clinical Psychotherapist and Researcher at HIR Wellness Center, Inc. nonprofit organization located in Milwaukee, WI. It is the first generation of mental health clinics that directly addresses Historical Trauma and systemic adversity as a primary focus. Their mission is to provide a culturally responsive and trauma-informed approach to providing mental health and wellness services for Indigenous and disenfranchised communities. Since 1998, Lea has worked in various settings to support, advocate and help heal children, youth and their families. Lea has previously worked for First Nations Studies and the Milwaukee Public Schools system to support First Nation Students as an Academic Advisor. She has also worked as a clinical therapist to provide TF-CBT to sexual abused and human trafficked children and youth. In her work, Lea teaches social-emotional learning from a culturally responsive lens. In her teachings, Lea utilizes the Medicine Wheel to help students understand how everything is interconnected and part of a greater whole. In 2016, she earned a Master’s Degree in Clinical Mental Health from Mount Mary University for her work on ‘Wisconsin First Nations People/Native Americans on Historical Trauma’. In her study she explored Historical Trauma and how it still impacts native communities today. She believes that it is important to honor our ancestors, acknowledge the hurt, and recognize how hope can help us grow in healthy ways. Lea also teaches as an adjunct instructor at Mount Mary University. Most recently, Lea presented her research in Banff, British Columbia, Canada for the 2nd International Neurosequential Symposium, and in Cape Town, South Africa. She has been invited back to the 3rd International Neurosequential Symposium conference in Banff this June (2018) to share her next CBPR project, currently being conducted with her community partners, Mount Mary University and Southeastern Oneida Tribal Services. She has also presented at local, state, tribal, and international conferences on various topics such as Trauma Informed Care, Historical Trauma and Transgenerational Trauma, Human Trafficking, Self-Care & Resilience, and Caregiver Support. Her Community-Based Participatory Research (CBPR) seeks to better understand the social epidemiological impact of Historical & Intergenerational trauma. Lea has been a strong advocate of the Wellbriety Movement and has worked to bring White Bison’s programs to the HIR Wellness Center and her community in Milwaukee, WI. Recently, she has coordinated a #SilentNoMore Screening and helped bring our newest training program, #SurvivorsofHomicide, to her community. 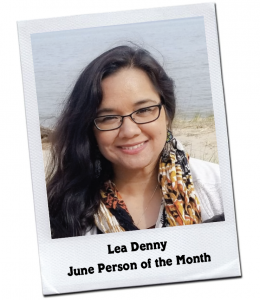 Congratulations Lea Denny! 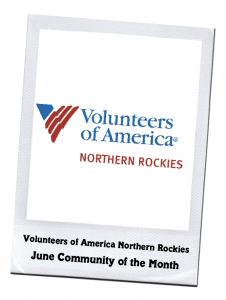 Volunteers of America Northern Rockies is a national, non-profit located in Sheridan, Wyoming. From 2016-2017, they compassionately served and strengthened nearly 9,000 individuals by empowering them to build healthy and happy lives. Volunteers of America Northern Rockies offers a wide variety of services including helping individuals struggling with addiction find sobriety, helping low income seniors find affordable housing, and providing mothers in need with basic necessities. Volunteers of America Northern Rockies also offers services specifically designed for Native Americans through their Native American Cultural Enhancement Program (NACEP). To develop the program, Volunteers of America Northern Rockies collaborated with nine Native American tribes and incorporated White Bison teachings and curriculum. This program is available at both of their residential treatment programs, which serves tribes across Wyoming, Montana, North Dakota and South Dakota. The NACEP curriculum incorporates cultural activities and teachings to introduce or reintroduce the importance of tribal spirituality an diving in harmony with traditions. In 2014, Volunteers of America Northern Rockies became the first Wellbriety Certified Treatment Center. As a Wellbriety Certified Treatment Center, Volunteers of America Northern Rockies, incorporates traditional Native American cultural approaches, such as smudging, pipe ceremony and sweat lodges. They also incorporate culturally- based Wellbriety curriculum, including the Medicine Wheel and 12 Steps, Mending Broken Hearts, and Warrior Down Recovery Coach course, materials and related counseling services.